Manado (also Menado) is the largest city in and main gateway to Northern Sulawesi, Indonesia. The capital of the province, the former stronghold of the Dutch and the cultural center of the Minahasa people, for a long time Manado prospered through trade with the nearby Philippines and the spice trade with the rest of the world. Alas, the bombings of World War II and the suppression of a local insurgency in the 1950s flattened most of Manado's older buildings. While by Indonesian standards still relatively prosperous, most visitors will be rather less impressed and head straight to the islands and reefs of nearby Bunaken. Unlike much of the rest of predominantly-Muslim Indonesia, Christianity is the dominant religion in Manado. Mostly sunny throughout the year, the wet season usually starts from September until March/ April. During its hottest days, it can reach up to 32C. In the highlands of Tomohon, Tondano, Kawangkoan it is cooler but sunny nonetheless. Manado is quite far from the rest of Indonesia and most visitors arrive by plane. Manado's Sam Ratulangi Airport (IATA: MDC) An airy, modern facility last expanded in 2001. The airport fields some international flights to Singapore (Silk Air, 4x weekly, 3h) with visa on arrival possible, but Air Asia no longer operates. If you want to make a call in the airport, please have your cell phone ready, don't count on the public phone. There are also frequent flights to Singapore (Silk Air), Jakarta (Garuda, Lion Air 3,5h, 1,100,000+Rp) and Makassar (1.5h). Other flights include Surabaya (East Java), Balikpapan (Kalimantan), Denpasar (Bali), Ternate (North Maluku), and Sorong (Papua). A taxi from the airport to central Manado takes about 30 minutes and costs Rp 70,000 (bargaining may be necessary). There are also frequent mikrolets leaving from Terminal Paal 2 [paal doo-ah] costing 4,000 Rp that take about the same amount of time. Departure tax from Manado is Rp 100.000 for international flights and Rp 30,000 for domestic flights. The terminal has an Internet cafe in the public area and the standard array of restaurants (KFC, Es Teler 77) and gift shops inside, but note that there is nothing once past immigration. The main ways of getting around are ojek/ompreng, moped taxis that can be a bit scary, or with Mikrolets (mikros), the blue mini buses that you jump on just standing by the street. They all have a certain route and within a day one should figure out how it works. There are several taxi operator here : Bluebird, Taxi Kokapura, Trust, Celebrity. The most reliable one is Bluebird, the blue taxi. It is the most trusted taxi operator in Jakarta and other cities in Indonesia. The Manado office phone number is (0431) 861234. If you're new to the town, use this taxi. Wybisana. Even is meter taxi, you must beware as they will tend to making extra mile near the area that you intend to go, and making you paying extra according to meter. This is especially for taxi from hotel to airport, you may want to get a taxi from hotel by negotiating the price upfront. Not very convenient to get taxi in the city from the street. Can only get from major malls. Even big hotels don't have taxi rank. You'll need to pay parking fee if taxi has been waiting inside parking area. Not a very good option for transport unless you are patient. Also known as mikrolets or bemos. Angkot is the typical Indonesia's cheapest way of transportation inside the city. Most of cities in Indonesia have this Angkot, as well as Manado. Angkot is a minibus of 8-10 passengers. The cost is very cheap, currently at Rp. 2,900 per trip. Compared to angkots in other cities in Indonesia that have side-facing seats, the ones in Manado come with all front-facing seats. Manadonese are known for being picky and would only take the good-looking and full music angkots. Manado Rental Car around Rp. 500,000 per day, already included Driver and Gasoline, or Self Drive aproximately Rp.300,000.- per day. For Central Information tel +62-852-4022-0620 or +62-431-892-979. CV. Sinar Berkat Rent a Car Manado, has been operating since 1995 has various types of automobile. For administration you just need to give a copy of your current driving license or ID card. Reservation can be made through email at [email protected] or mobile at +62 812 440 41000 or +62 431 331 8517 with Mrs. Like. Office +62 431 869 625. The rental charges is based on type of vehicles, itinerary and additional services if any. We suggest you to call and fixed the schedule, rate and other services needed in advance for your convenience. Call and make your booking, we will be very happy to have you as our customer. CV. Griya djaya, +62 852 4063 2189 or +62 431 840 496 (Mr. Ito) provides self drive car at 350.000/day car is icluded driver ,gasolin and tour english speaking tour guide rp 800 000 per day contact [email protected] mobile phone +6281340310671 (price as of Mar 2016). Fast, good service and nice car. Not so easy to find an agency with self-drive cars, but recommended if you have experience driving in Asia. Taxi service is limited. Ojek is motorcab taxi, pronounced O - jack. Ojek is also a typical cheap land transportation in Indonesian cities. In Manado, ojek rate is not fixed, depending on the distance and negotiation. For a very short distance (+/- 1 km. ), it will be around Rp. 3,000. Ban Hin Kiong is the oldest Chinese temple built in Manado during the Qing Dynasty era in China (1644-1911). It is a house of worship for the Tridharma followers from Manado and the region.This Temple is located at D.I. Panjaitan Street in Manado, which is the center of the city’s China Town. There are some shrines and temples, homes and interesting shops run by Chinese. The temple is easily reached by public transport, by mikrolet or taxis. Visitors can also rent a car or motorcycle to tour China Town. Modoinding. Agrotourism place, where all kind of vegetables and spicy came from, to supply the demands of East part of Indonesia, the area is about 900-1200 meter from the sea level. The place is cool and you will find Modoinding valley with Moat Lake with "Bukit Doa" on the east, very beautiful place. There is also Ambang National Park where you can see Golden Owl as favorite for Bird Watching activity. About 180 km from Manado. You also able to stay in the community house, Traditional Minahasan wooden house with IDR 200.000, approx 20USD a night for the small house with western toilet and shower. Manado Inter Money Changer, located in front of Bahu Mall, next to Bank Tabungan Negara (BTN), Jl. W. Monginsidi No:62 Bahu Link: III Manado, Ph: +62-431-866676 & +62-431-866677. ikan mas bakar rica, grilled spicy fish cooked in traditional style, using a piece of coconut shell as a way of cooking. Grilled together with chilli, that poured in the fish while cooking. ikan mas goreng, fish fried till the soft bone is crunchy. Extreme Culinary, Snake, Rat, Dog (r.w. pronounced "air weh"), Bat / flying fox (baniki), Forest Pig, etc., Ask Manadonese people to bring you to Kawangkoan - Langowan. And Tomohon also. Fresh grilled fish is served every morning in a small warung near the harbour dock to Bunaken. The place is very basic, but don't mind the look. Just ask around for warung ikan bakar and hope someone helps you. Rit's Cafe, Steak and Grill a warung among others behind (slightly southwest) of the Mega Mall on Jalan Boulevard II. Lovely owners (Tony and Rita) and delicious food. Ask Tony to try his chocolate rum pudding. Raja Oci, Jl. Sudirman No.85, Ph: +62-431-863946. Seafood Restaurant with "Oci" as speciality fish. Bambuden Seafood Restaurant @Sario, Jl. Pemuda No:2 Sario Manado, Ph: +62-431-852459 / 864096 / 9197772. Well-known locally for grilled & fried fish, and also offers a variety of seafood dishes. Kawan Baru Restaurant and Cafe, Mega Mas Boulevard, tel. +62-431-879490 +62-431-879491, . Indonesian food. Raja Sate BBQ & Asian Resto, Jalan Boulevard (near Mega Mall), tel. +62-431-3327380 or +62-431-846679, . Asian cuisine, with an emphasis on satays and barbequed seafood. Warong Rica Rica, tel. +62-431-879490. A seafood restaurant located at Bahu Mall Bay street Cafe. Local seafood with panoramic sea views. Kafe Excelso, . Conveniently located in Mega Mall. Best place for coffee and light snacks. Good wifi, large coffee selection. Please Drink Responsibly, the locals have a bad habit of drinking IRRESPONSIBLY. Probably, the ONLY major crime problem in town is caused by drunkards. Manado is Sulawesi's other bustling centre of business and tourism. And with demand to match, the prices here are higher than elsewhere in Sulawesi. However, if you are willing to pay up, luxury options that you haven't seen since Makassar are available here. There are 3 main providers of GSM cellular services in Manado : Telkomsel, Indosat / Satelindo and XL (Axiata co). As per November 2010, Telkomsel provides EDGE, 3G WCDMA, 3.5G HSDPA. Indosat only GPRS,EDGE. XL up to 3G. Please note that high bandwidth cell service mainly works in downtown area of Manado. All 3 of them carries Blackberry services. Prepaid GSM SIM cards dan CDMA RUIM cards can be cheaply purchased (approx 1 USD) at almost every supermarket along with their reload vouchers, ranging from approx 50C US (Rp 5000) to approx 10USD (Rp 100K). If you want to go online cheaply then go to Ocean internet cafe, at the 3rd floor of Samudera minimarket located in the Megamas shopping center area on the Manado boulevard. The rate is approx 50C US (Rp 5000) hourly and the bandwidth speed is good. It is open from 1000 to 2200. Island Bunaken a diver's paradise. Many small bungalows are available in this small but beautiful island. The local ferry to Pulau Bunaken leaves at 14-15:00 daily but Sundays from Pasar Jengki, and costs 50,000 Rp per person. The standar fare for lodgin in Bunaken is 150,000 Rp per person, 3 meals included. Tagulandang Island (Sitaro). An unexplored island 3 hours North by ferry from Manado. Ferries depart daily at 9:30 (except Fridays at 10:000, and Sundays at 11:00) from Manado Sagnier Terminal. The cost of the ticket is 175.000 Rp. The island has nice landscapes, a volcano, good snorkeling and secluded white sand beaches. Tangkoko National Park Home of The Big-eyed Tarsius Monkey (The Smallest Monkey In The World). 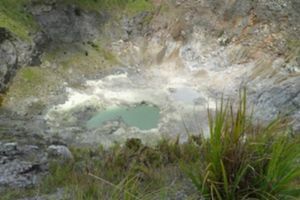 Tomohon, a small city, surrounded by 3 active volcanoes: Mount Lokon, Mount Mahawu and Mount Masarang. Located around 25 minutes from Manado, Tomohon is a very nice place to stay for its cold climate (around 20 degree celcius). Pulau Sangihe (Sangir). The ferry to the main city, Tahuna, leaves daily from Manado harbour, next to Pasar 45, at 19:00 and costs 155,000 Rp. Currently (August 2015) there are no diving centers in Sangihe. This page was last edited on 17 April 2019, at 09:16.